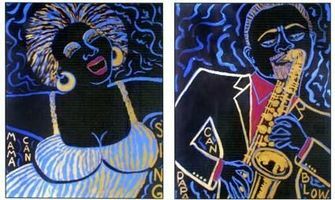 Sugar Hill Songbook: Select Work of Faith Ringgold features a collection of works on paper, soft sculptures, quilts and illustrations inspired by the rich cultural and political heritage of the artist’s home of Sugar Hill. The exhibition showcases work attesting to Ringgold’s relationship with Jazz, while also framing her longstanding commitment to social and political activism. As the author and illustrator of seventeen acclaimed children’s books, art and storytelling from the pages of Harlem Renaissance Party, We Came to America, as well as Tar Beach, Faith Ringgold’s modern classic and first published book for young readers, will also be featured throughout the exhibition. This exhibit is on display through March 31, 2019 and also is accompanied by intergenerational activities exploring the global impact of Faith Ringgold and how she has sparked the imaginations of children through art and storytelling.